In Europe, France is continental champion and qualified to the World Cup together with Wales. I guess all it takes is enough players playing in Australia or England to cobble a team together to qualify to the RLWC. Jamaica have only ever play 20 international matches. thatrugbyguy wrote: I guess all it takes is enough players playing in Australia or England to cobble a team together to qualify to the RLWC. Jamaica have only ever play 20 international matches. As sad as it sounds, that's the case. I think the biggest shame was the US team. Qualified on their own just to be replaced by Ozzies and Poms in the World Cup. 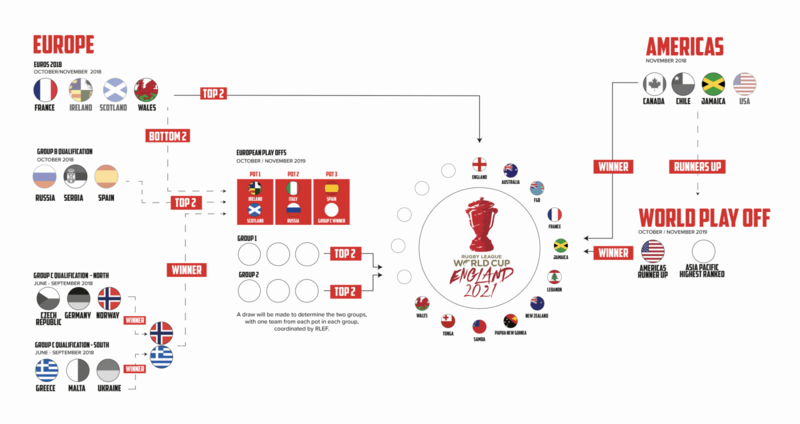 What bugs me is there seems to be no regulations involved with RL internationally, it's literally if you can put a team together you're eligible to qualify for the world cup. No standards in terms of domestic competition or player base, no criteria needed to be able to gain membership, no concrete rules when it comes to player eligibility, literally anyone can just throw their hat into the ring. I know the sport is desperate for it's world cup to be taken seriously, but everything they do is short term thinking with no structure in place to build off. thatrugbyguy wrote: What bugs me is there seems to be no regulations involved with RL internationally, it's literally if you can put a team together you're eligible to qualify for the world cup. No standards in terms of domestic competition or player base, no criteria needed to be able to gain membership, no concrete rules when it comes to player eligibility, literally anyone can just throw their hat into the ring. I know the sport is desperate for it's world cup to be taken seriously, but everything they do is short term thinking with no structure in place to build off. The funny thing is that they're taking spots away from countries where they actually have a grassroots game. Serbia keeps missing out on the RLWC despite them having 15 or so active clubs while Lebanon or Scotland keep making it because they have a bunch of Aussies playingfor them. iul wrote: The funny thing is that they're taking spots away from countries where they actually have a grassroots game. Serbia keeps missing out on the RLWC despite them having 15 or so active clubs while Lebanon or Scotland keep making it because they have a bunch of Aussies playingfor them. Well that's the thing, there are countries who are putting the work in, with little to no help from the international federation, who suddenly get left out in the cold when a bunch of professional players decide they want to play at the world cup, many of whom have never stepped into the country they are supposedly playing for. Say what you will about the size of RL in America, but there's been a domestic competition there for over 15 years now and a lot of work has been done to try and grow the game with absolutely no help from anyone else, only to now be supplanted by a nation that has the benefit of a bunch of heritage professional players who only wear the national jersey occasionally. Now I am not sure if I remember that right, but didn't "USA" play with only Ozzies at the last RLWC as well, after the regular players qualified for it? Thomas : ¿Do you have more information about that "Americas Cup"? It seems that there is a chilean team located in Washington D.C (named Waichafes) but there is not local activity of that sport. I wonder how representative they really are. Have no other details, this could be ex-pats if there is no competition. The only competition I am familiar with is in Ecuador. "MSI made history by taking an England-New Zealand Test to Colorado earlier this year, a game that was well received in the Denver region. However, a crowd of less than 20,000 resulted in chief executive Jason Moore suffering a seven-figure loss. While the players have been paid, the New Zealand Rugby League and the Rugby Football League (the governing body for professional rugby league in England) were out of pocket to the tune of more than $400,000." If you make a 7-figure-loss while 20k people are attending, assuming they paid an average of 50$ (Ticket prices were apparently 15-100 $), that's a calculation of 40-50k people. How on earth did he expect to reach that figure? He may have thought he could bring more corporate sponsor or sell TV rights at a higher price. RugbyLiebe wrote: If you make a 7-figure-loss while 20k people are attending, assuming they paid an average of 50$ (Ticket prices were apparently 15-100 $), that's a calculation of 40-50k people. How on earth did he expect to reach that figure? The figure is about right. From what I’ve heard and read Jason Moore genuinely thought 40,000 was achievable, in part because the assumption was people in Denver would think it was the All Blacks, not taking into account rugby fans in Denver knew the difference and might not care. See, I was involved with Rugby League for years, and the one thing I know about some people in the community is they are blind to the realities of the sport. I know because I use to be one. The World Cup being scrapped in the US is not surprising to me in the least because it once again shows the arrogance of a sport that thinks all it has to do is show up to win people over. What some involved don’t want to do is admit to themselves how artificial their international game is and how little that actually helps long term. Without the countless amount of professional and semi pro players from Australia, England and New Zealand filling the ranks of smaller teams, some of whom never having even stepped foot in the country they are playing for, the World Cup would be completely pointless. They need to spend 20-30 years and countless millions in investment to make any genuine change, or they can continue the masquerade and hope people take notice one day. In NFL terms League is obsessed with throwing as many 'Hail Mary's' as possible in lieu of going short and steady, and occasionally one will stick. Rugby is a lot more focussed on the mid to short 5-10 yard passes and runs, by trying so hard to overtake Rugby, League is struggling to keep up. Being short sighted goes hand in hand with some people in the RL community. The Super League war 20 years ago is ultimately what drove me away because it was clear for all the talk of making RL a truly global sport nobody thought about the amount of work that would be involved in order to make that happen. We couldn't even get expansion right domestically let alone internationally in the mid 90's. It's one thing to be ambitious, it's another thing to be blind to the challenges you're facing and that's what I couldn't stand. I don't know what it's like in England, but there is this deep obsession in some parts of the RL community with beating Rugby, almost believing they deserve the international attention more and that if only people were exposed to the game things would be different. Well, that's been proven wrong time and time again as evident by this World Cup news as being nonsense. thatrugbyguy wrote: Being short sighted goes hand in hand with some people in the RL community. The Super League war 20 years ago is ultimately what drove me away because it was clear for all the talk of making RL a truly global sport nobody thought about the amount of work that would be involved in order to make that happen. We couldn't even get expansion right domestically let alone internationally in the mid 90's. It's one thing to be ambitious, it's another thing to be blind to the challenges you're facing and that's what I couldn't stand. I don't know what it's like in England, but there is this deep obsession in some parts of the RL community with beating Rugby, almost believing they deserve the international attention more and that if only people were exposed to the game things would be different. Well, that's been proven wrong time and time again as evident by this World Cup news as being nonsense. Outside of Australia, I don't see it, maybe because of the demographics or the fact there are more people than in the urban centres of Australia but they are aware pragmatically they will always be the smaller sibling the fact that RL/RU Clubs share grounds and facilities tells lot about the mindset in the UK and possibly in Europe but cannot really comment what happens on the continent. A case in point is Ealing Rugby in the second tier of Union and share facilities with London Broncos - 2 different sports working alongside each other. Unfortunately in Australia RL is in a bubble and don't see what happens beyond the shores, so when things don't work out they are surprised at the outcomes. Toulouse and Toronto have declined to pay any money.